Cloud computing can benefit your club's operations and member experience, likely in ways you hadn't even thought of. Well, those are but a few of the proliferating perks made possible by cloud computing. And what does it have to do with your club? A lot, today. And more, tomorrow. Because the cloud is virtual rather than tangible, it may seem elusive, phantasmal, but, in all probability, you’re already making good use of it—either personally or professionally. If you use an Android phone, you may well be storing your photos, music, or personal files in the Google cloud; or, if you have an iPhone, in the Apple cloud. You may also use your smartphone to access Dropbox for similar reasons. And companies are utilizing the cloud to help them perform a wide range of business tasks. The cloud allows them to both do new things and do old things more easily, efficiently, and economically. Basically, they’re outsourcing a ton of data-related functions. That means clubs no longer need expensive, high-end computer hardware and software or highly paid technicians on site. Nor do they have to worry about software glitches, equipment breakdowns, or safely securing vital information. The cloud provider does all of the heavy lifting. The club simply needs a tablet, smartphone, or desktop computer to go online. Consultant Bryan O’Rourke, the president of the Fitness Industry Technology Council (FITC), based in Covington, LA, points to SoulCycle, the group-cycling brand owned by Equinox Fitness, as an industry example of the cloud in action. Using the SoulCycle mobile app, members—many of whom are millennials—can reserve specific bikes, purchase the sweats and capris their instructors are wearing, and download the playlists they hear in class. For a non-industry example, O’Rourke references Amazon’s Dash buttons, which utilize the cloud to allow consumers to order household goods simply by pressing a button, making shopping easier, and more personal and convenient. Fantasizing about future possibilities— which is hard not to do when you’re considering the cloud—O’Rourke envisions a facility where members don’t have to check in. Instead, their presence would be “sensed” when their mobile device is on the premises. This could, conceivably, alert an instructor about who’ll be coming to their class, or allow the snack bar attendant to have a member’s favorite smoothie waiting post-workout. The seminal question about the cloud is not: Do I want to use it? But, instead: How am I going to use it? The cloud is quickly becoming ubiquitous. You don’t buy the cloud, and hook products and services up to it. Rather, you purchase products and services that you want, that your club needs and can profit from, and which, it turns out, make use of the cloud. In a way, it’s like electricity, which is involved in virtually everything that transpires within a club—but which doesn’t arrive in a cardboard box or shipping crate. The cloud’s infinite versatility is making all sorts of exciting new things possible—for instance, real-time reporting of exercise performance, virtual classes, and self-diagnostic fitness equipment. Orangetheory Fitness, a franchise based in Fort Lauderdale, FL, has quickly grown to more than 360 studios in 36 states and seven countries. Part of its popularity and success is predicated on a proprietary heart-rate monitor, OTBeat Link, that all of its members wear. The device uploads heart-rate and calorie-burn data from the workouts—which consist of intervals of treadmill, rowing, and weightlifting activity, led by a trainer—to the cloud, where it’s synced with the Orangetheory mobile app. This allows users to review their data and identify trends over time. The information also is displayed, in real time, on screens in the club during the class, so members can see if they’re working out efficiently, and compare their effort to that of others. OTBeat Link also can be used to track physical activity outside the studio, allowing members to create workout histories. 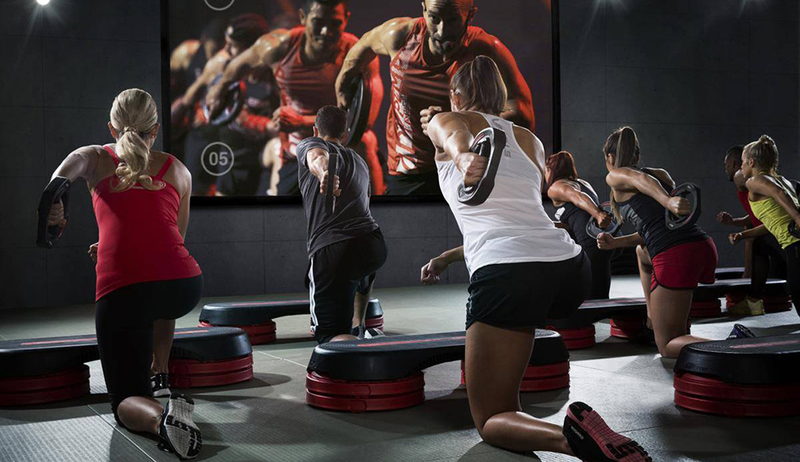 The studios, for their part, can use the Orangetheory app to connect with their members even when they’re away from the club. If you, like Orangetheory, have a club-branded app, you’re also in the cloud. Virtual fitness classes, offered by providers such as Fitness on Demand, Wellbeats, and Wexer Virtual, depend as much on the cloud as they do on electricity to do what they do. When, as Wexer does, you’re providing class content to clubs in 40 countries, including the majority of the 25 largest chains, efficient and virtually instantaneous delivery is critical. Club management software and fitness equipment suppliers were among the first industry high-fliers to venture into the cloud, and, today, most of the larger companies already have a major presence there. Many of the former, it seems, have taken up permanent residence in the stratosphere, and, increasingly, fitness equipment suppliers are also doing business there. Virtually all of the major manufacturers—Precor, Inc., Technogym, Life Fitness, Matrix Fitness, and others— are utilizing the cloud to provide programming, tutorials, exercise tracking, entertainment, challenges, competi- tions, etc. ; and many are now using it, as well, for asset management—the ability to monitor, evaluate, and more effectively maintain equipment. Some build in this functionality, but there also are companies that offer it á la carte. One such company is ECOFIT Networks, Inc., based in Victoria, British Columbia, Canada, which provides what it calls “fitness equipment intelligence.” The firm’s sensors connect to any brand of equipment and track usage. The resulting data is sent to the cloud, where club owners and operators can access it via a mobile device or desktop computer. ECOFIT data also can help senior staff make decisions about appropriate equipment positioning; whether certain types of equipment should be replaced by something else; and, in the case of multi-club operations, how to allocate resources most profitably. “If a club company has 30 locations, management can review the ECOFIT data, and see that one location could use more tread- mills, whereas, at another, some of its treadmills are getting little use. So, instead of purchasing more tread- mills, they could simply move the equipment around. “Not everyone can be a SoulCycle, or wants to be,” acknowledges O’Rourke. “But IHRSA clubs should be rethinking their business models and what they’re trying to accomplish. I suggest that they start with the funda- mental questions: How am I trying to compete? How is my business model designed to operate? In the final analysis, though, you really don’t have to worry about going into the cloud ... because the cloud is coming to you.